Aid to Ukraine was under discussion this week. The Budapest Memorandum, signed by the Clinton administration in 1994, guaranteed the territorial integrity of the Ukraine in return for the surrender of 1,800 ex-Soviet nuclear weapons on Ukrainian territory. It was signed by the US, UK and Russia. The US has given no arms to Ukraine after Putin seized the Crimea and sponsored the separation of two rebel areas in eastern Ukraine from Kiev. Our inaction demonstrates that our word, at least in executive agreements involving nuclear weapons, is no good. We have done absolutely nothing to defend Ukraine's territorial integrity. Putin has two big problems. The low price of oil means he's broke, and his suppression of the Union of Mothers of Soldiers of Russia for counting casualties from the Ukrainian conflict, means he can't take large casualties. Putin is trying to distract his populace from their economic problems with military victories. If Putin is defeated in Ukraine, he will have to retreat from Syria. If Putin is defeated in Ukraine, he may lose office and, without his position to defend himself, he may lose his life. The last time oil prices were this low, Russia went bankrupt, Boris Yeltsin was forced out of office. That's how Putin gained power. It could easily happen again. This will not put ISIS in control in Damascus. ISIS is in the process of being wiped out as a conventional military force that can hold territory. It turns out that the US Air Force can actually kill ISIS forces if the rules of engagement are reasonable, as they are now under Trump. Air power is only ineffective when the president wants it to be, like the Smartest President Ever seemed to want. Iran wants a Persian Empire stretching from Pakistan to the Mediterranean Sea. Russia has interveniened in Syria to help Iran achieve their goal of empire. I don't think it's in our interests. Iran prays daily for "Death to America." I choose to take them at their word. I gave you a slight exaggeration on the price of oil. When Boris Yeltsin was forced out of office, the price of oil was about $25 a barrel. But the point is that wars are expensive, and up to 80% of Russian export earnings come from energy exports. At $50 a barrel, the Russian government is running a big deficit because it's spending too much. President Trump's energy policies are going to expand US energy exports and put pressure on world energy prices. Trump withdrew from the stupid Paris agreement. Trump stopped the EPA's war on coal. Trump has opened almost all federal land, including the Alaska National Wildlife Refuge, to drilling. Under Trump, the federal government has quickly approved every application for a liquid natural gas export terminal. All of the pipelines Obama stopped, Trump approved already. In natural gas, the Russians are going to lose market share. The European price for natural gas is currently about $5.20 per million Btus. The US price is about $3. Even allowing for transportation costs, the price in Europe has to fall as more US LNG reaches the market there. It will be harder for Iran to get everything it wants without Russian help. They will have to chose between nukes and empire. I think they will chose nukes. Your opinion may vary. The most likely outcome in Syria is partition. Damascus will remain under Bashar al Assad's control. A mixed group of Kurds and Arabs will control the Northeast. Shiites or chaos will rule the Southeast. Jordan and Israel will try to keep Sunis in control of the Southwest. The Russians win in the Middle East if they make a mess, because all they want is for the price of oil to go higher. If there's chaos in the Middle East, there will be less oil production. It's as simple as that. Not giving the Ukrainians any help at all means that nobody will ever give up their nukes ever again. They will know they will get NOTHING in return. Giving the Ukrainians enough arms to stop further Russian attacks is just good sense. It shows Putin that it costs him too much to attack westward. Would you rather wait for Putin to attack a NATO country, like Latvia, Lithuania or Estonia? Liberals say, "If Assad were removed and replaced be by Sunnis the most likely outcome would be Hezzbollah in Lebanon would be cut off and the result in Lebanon would be Sunni genocide against Christians and Shia"
Malarkey! Hezbollah is the most powerful armed force in Lebanon. Hezbollah controls the Beriut Airport. Iran ships arms to Hezbollah through the Beirut Airport and also through the Damascus Airport and then by truck convoy to Hezbollah territory in southern Lebanon. Hezbollah is the reason that Assad can't be driven from his core territory. They back him up. Before the Russian intervention, ISIS was the biggest Sunni power. The US, the Kurds and the Iraqi Army have flattened ISIS and killed most of their fighters. They ain't coming back from the dead. The Sunnis in general are not coming back for at least 5 years. The Syrian civil war has resulted in mutual exhaustion of the local Syrian forces, except for the Kurds in the northeast. That's why all of the locals called in outside help. For example, the Iranians hire Afghan Shiite mercenaries to fight in Syria, because Assad is out of people who will fight for him. The people who still nominally back Assad will fight only to protect their own villages and local areas. It's a matter of self preservation and religious freedom. Assad is the enemy of their enemies. That does not mean they support everything he does. Liberals need to check their bi-coastal elitist privilege. There’s a whole world out here where arugula ain’t on the menu. 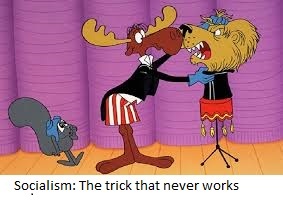 The Democrats' openly socialist ideology is a joke out here in flyover country because, like Bullwinkle pulling a rabbit out of his hat, it’s a trick that never works. The latest example is Venezuela, a once mildly prosperous petro state now experiencing famine and food riots. My advice to liberals: if you’re going to be arrogant and dismissive, try to have something behind it other than bluster and manure from MSNBC. I thought liberals or progressives or whatever were all angry that Trump was selling out to Putin. Their responses on arming Ukraine sound more like they really wanted to sell out to Russia themselves, and are angry that Trump may have beaten them to it. All of that assumes they believe their own propaganda. So far, Russian contacts aren't illegal. In a delicious irony, Hillary's campaign is reported to have contacted Ukrainian sources for dirt on Trump. But we all know the law only applies to enemies of Democrats.